Lest you think I’ve moved on from thinking about brinner, I’m here to tell you that a) I have another brinner-ful recipe for you and b) it’s impossible for me to stop thinking about brinner. Remember that one time we chatted about the winter blahs and having a Backwards Day Brinner Bash to get over them, if even for just one meal? And we drooled over loaded mashed potato stuffed biscuits? Yeahhh, now you remember. 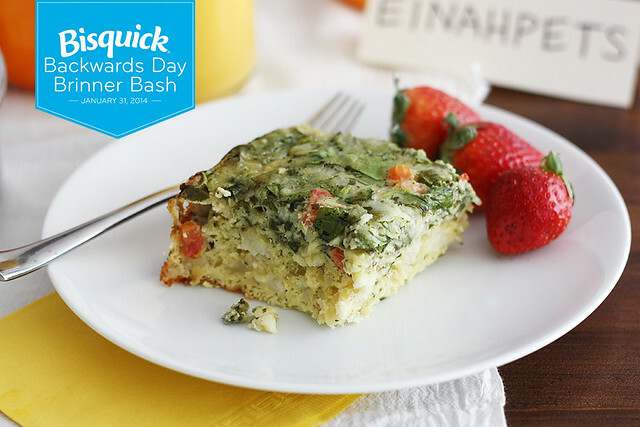 Well, meet its lovely partner, the slow cooker cheesy pesto and spinach egg casserole, a.k.a., the egg bake of your dreams (and if your dreams are anything like mine, they include egg bakes). The lovely people at Bisquick asked me to come up with a slow cooker egg casserole using their product and, truth, at first I was a little afraid of the idea. I mean, I love my slow cooker with a capital L but it can also befuddle me in terms of what actually can bake/cook in there, for how long, etc. etc. (it’s like that thing where I know what mirepoix is and how to cut a pomegranate but I don’t know how to properly make an omelet or what, exactly, constitutes as one shallot. Conundrums.) But after a little planning, research and breath-holding, I figured it out. And the results were spectacular. This egg casserole is one fine and dandy addition to your Brinner Bash. It’s easy to assemble, and once you’ve done that, the slow cooker does its thing. In just a few hours, it’s all done and ready for the eating. So not only do you get yummy food, but it works for you while you make biscuits and get your party ready (insert celebration and thumbs-up emojis here). If you’re not a fan of one or more of the ingredients, not a problem — feel free to swap them out with something you do love. For example, if you’re not fond of pesto, swap it with salsa or your favorite tapenade. Use fresh bell pepper in place of the tomato, or mix in some Parmesan cheese with the mozzarella. GO CRAZY. As crazy as you can making an egg casserole, that is. For more tips and fun Backwards Day Brinner Bash ideas, check out this post. You can also head over to Bisquick for more breakfast as dinner recipes and Backwards Day ideas! And follow Bisquick on Facebook, Instagram, Tumblr and Pinterest. Line bottom and sides of a 6-quart slow cooker with foil; spray with cooking spray. 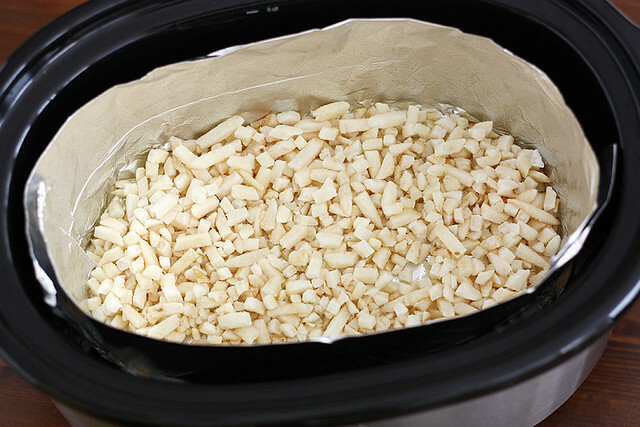 Spread hash brown potatoes in a single layer in bottom of slow cooker. In a large bowl, whisk together eggs, Bisquick and milk until well combined. Stir in spinach, cheese, pesto, minced garlic, chopped tomato and salt and pepper to taste. Pour mixture evenly over potatoes in prepared slow cooker. Cover; cook on HIGH 3 hours until center is set, edges are golden brown and a toothpick inserted in the center comes out clean. I love this idea! Always looking for new ways to use my slow-cooker! Pinning! Looks delicious! I love anything with pesto, but I’m not sure I’ve tried it with eggs before. Such a good idea! 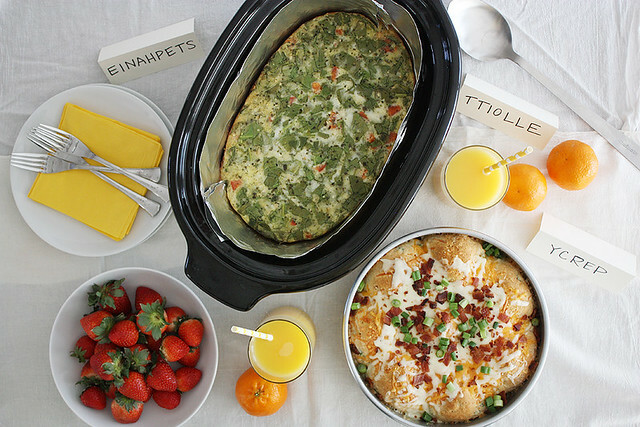 LOVE breakfast casseroles of any kind, and am just about dying about cooking it in the slow-cooker. I can’t believe it works! So pretty too! I love slow cooker recipes but never thought of a casserole! Love this recipe!! mmmmk I’m going to need this in my life ASAP! 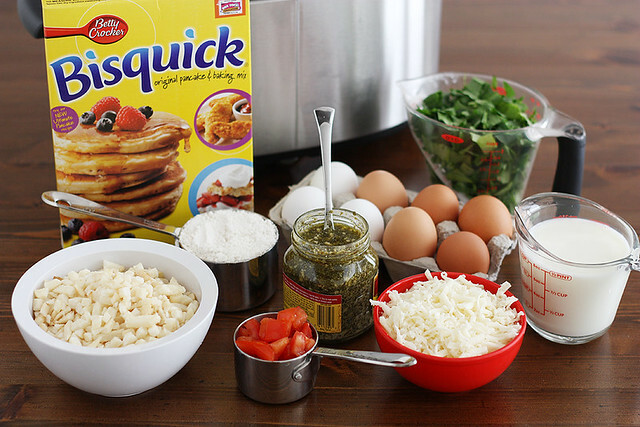 Never woulda thunk it to use Bisquick in the slow cooker…this looks delicious, though! I’m thinking brinner needs to happen in our house ASAP. Anna — Thanks so much (and thanks for pinning :))! 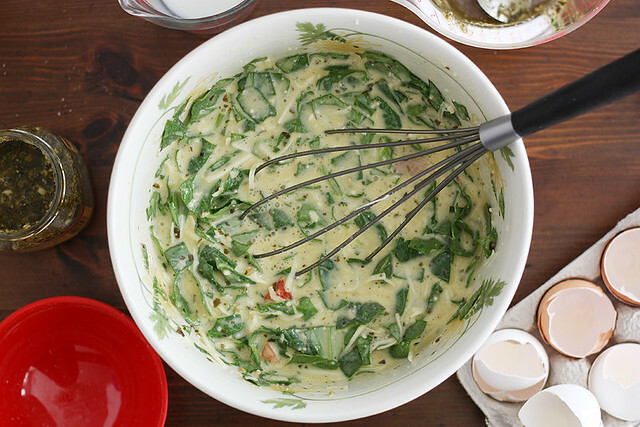 Lindsay — Oh man, eggs + pesto = tasty tasty goodness. 🙂 Thanks! Nicole — It may have changed my life, knowing I can make one in the slow cooker. 🙂 Thanks! Layla — It’s so good! Thanks, dear! Marie — I would not disagree. 😉 Thanks, friend! Taylor — I think that’s a mighty fine plan. 🙂 Thanks, dear! I absolutely love meals like this. So simple and so delicious! Katrina — Those are my favorite kind of meals, too. 🙂 Thanks! OMG I need sleep. I was so confused by all the backwardsness! Hahaha! We are all about breakfast for dinner these days because I either don’t have time to make eggs for breakfast or would rather go back to bed while Andy sleeps. Wow, this looks awesome! 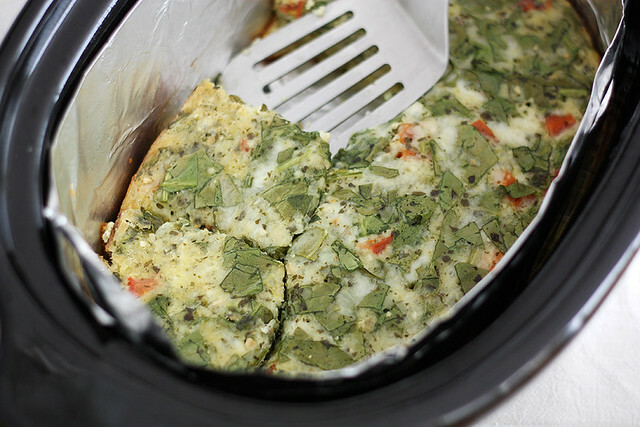 Never thought to make an egg casserole in the slow cooker but what a great idea and so glad you shared this with us 🙂 Love this recipe girl! Brinner – I love that!! 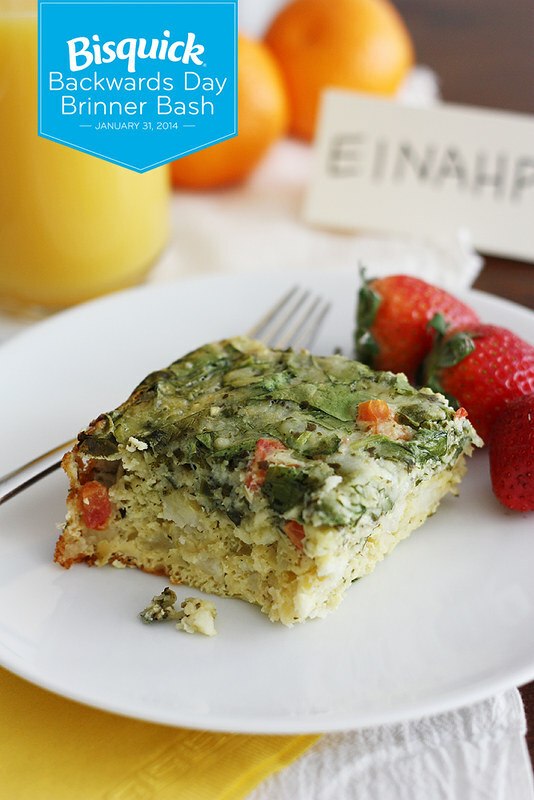 What a delicious looking egg casserole – I would eat this any time of day!! Wohh! Mind blown. 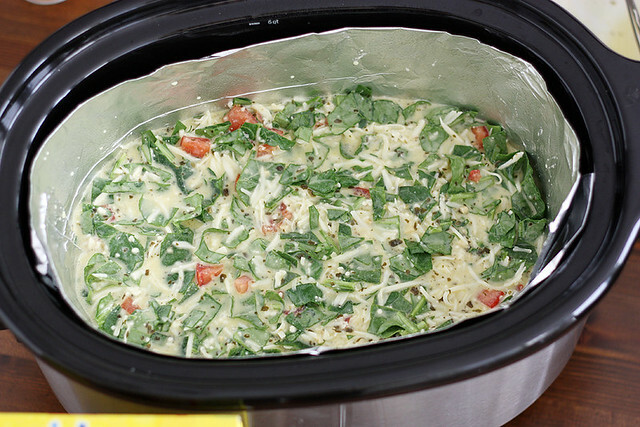 Never would have thought of cooking an egg casserole in a slow cooker. Brilliant! Stephanie, this looks like a great dish morning, noon, or night! Steph, you know how I love brinner! This is amazing, mama. This is so cool! I can not wait to try it my slow cooker. This marry perfectly with a bitter leaf salad for Sunday brunch with the girls. Cate — Yes! I like the idea of eating brinner any time of day. 🙂 Thanks! Laura — It blew my mind, too, that’s for sure (especially when I took a bite of it). 🙂 Thanks, dear! Laurasmess — Yes, do it! Any pancake mix will do. It’s worth it for a good brinner/dinfast. 😉 Thanks! Whitney — Thanks so much! Belinda — Yes, that’s a perfect idea! Love it. 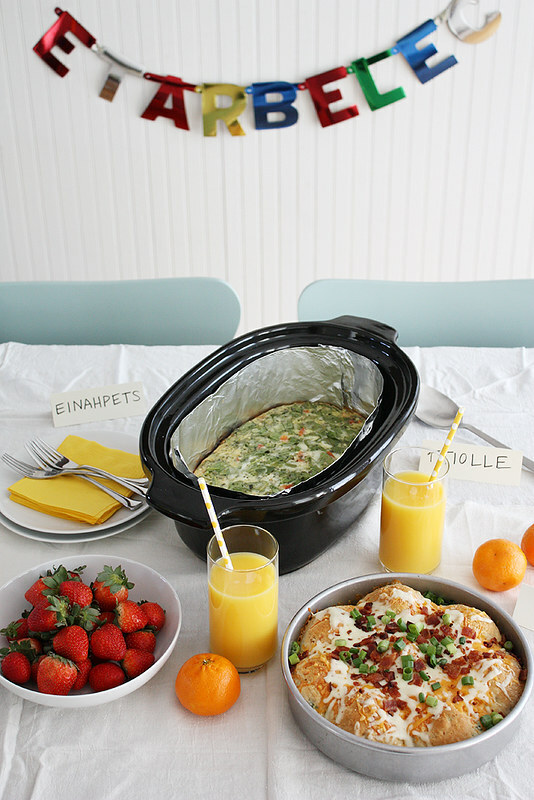 Oh I love brinner parties and this looks so delish and easy with the crock pot! Brinner all day, errr day. That’s how I want to live. Conundrums indeed! I’m glad I’m not the only one who still feels completely befuddled by the simplest of kitchen tasks. I guess that’s the joy of being self taught–you learn some of the hard stuff before the basics. 🙂 This really looks fabulous and who knew you could bake eggs in the slow cooker? Very cool!